South Ayrshire Council is one of 18 local authorities in Scotland to meet the historic 2012 homelessness commitment – with three months still to go until the new legislation comes in to force. The Council has already met the historic commitment ahead of time by abolishing priority need assessments, in effect giving every unintentionally homeless person in South Ayrshire the legal right to a home. The changes have seen an end to the current system where only those people deemed to be in ‘priority need’ previously had the right to a home. The Act passed in 2003 effectively extends the right to a home to single homeless people and couples without children. For the last nine years Scotland’s 32 local authorities have been preparing for the changes. Graeme Brown, Director of Shelter Scotland congratulated South Ayrshire Council on its commitment in preparing for the historic reforms. He said: “The 2012 commitment is internationally regarded as the cutting edge of progressive homelessness reform and South Ayrshire Council can be very proud that it is leading the way in making history. “I congratulate the council on its continued focus on meeting its responsibilities to homeless people and in its early preparedness for the reforms. In already having effective policies and practices in place, the council has ensured itself a smooth transition, meaning key resources such as temporary accommodations won’t experience a sudden increase in demand. Councillor Philip Saxton, South Ayrshire Council’s Portfolio Holder for Housing said: “We take homelessness seriously, recognising that it can happen to anyone and often not for reasons of their own choosing. All homeless applications to the Council are now assessed as a priority. “We’re delighted Shelter Scotland recognises and has endorsed our efforts to successfully meet – and comfortably exceed – the Scottish Government’s requirement to abolish priority need assessments for homeless people. “The Council also offers a range of effective support measures, aimed at quickly finding safe, secure and appropriate accommodation. 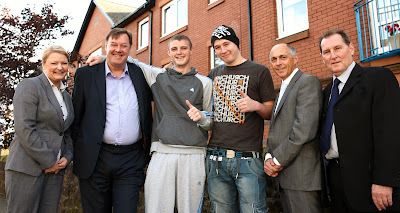 Local men David Sloan and John Keirs both agreed having come through the service to find accommodation after both had been homeless. John added: “Homelessness can affect anyone and the Council did all they could to support me when I was faced with this possibility. Thankfully for me I got a lot of help from the team and it did not happen. In David’s case, the process from presenting as a homeless person to finding accommodation took just under two weeks, giving him a fresh start.